A landmark collaboration between writer H. G. Wells, producer Alexander Korda, and designer and director William Cameron Menzies, Things to Come is a science fiction film like no other, a prescient political work that predicts a century of turmoil and progress. Skipping through time, Things to Come bears witness to world war, disease, dictatorship, and, finally, utopia. 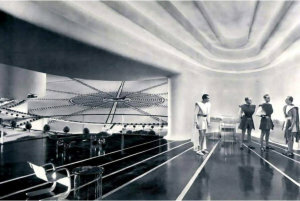 Vincent Korda, the film's production designer, turned to his fellow Hungarian émigré, László Moholy-Nagy, who was then living in London, to design the sets, which feature extraordinary curved atria criss-crossed by sky bridges, with elevators in glass tubes rising through them. (The sets also prefigured the spiralling interior of Frank Lloyd Wright's Guggenheim museum in New York.) In this vision of the future, the house has disappeared, the living is communal. This world more closely resembles one of John Portman's vast Atlanta hotels than a conventional house of the future. It is a common future fantasy, part communitarian dream, part nightmare, in which privacy and ownership have been lost. - Edwin Heathcote, Financial Times. From first to last, Things to Come was intended to bear the unmistakable stamp of H. G. Wells's personal vision. Adapted by the legendary science-fiction novelist from his nonfiction book of "future history" entitled The Shape of Things to Come, both book and film are earnest attempts to foretell the future, extrapolating from current conditions in the 1930s the course of human events over a hundred-year period. Divided roughly into movements, and thus analogous to a piece of music, Things to Come opens, prophetically enough, with the declaration of war in 1940, a prolonged war of attrition which the film envisions will last for decades. Later, following the outbreak of an epidemic known as the Wandering Sickness, society devolves into a new Dark Ages, in which the ragtag remnants of the old order fall under the sway of vicious warlords. In the final movement, a new utopian order arises, a strangely hieratic hybrid of socialist technocracy and benevolent despotism. In order to buttress his narrative through line, Wells employs the same stock types again and again, sometimes played by the same actors: Raymond Massey turns up on three separate occasions as stentorian superman John Cabal and his descendant Oswald, while Edward Chapman plays two versions of an accommodating every-schlub. After signing an unprecedented deal with producer Alexander Korda stipulating that not one word of his script could be altered in transition from page to screen, Wells continued to exert an exceptional degree of control over the film, vetting nearly every aspect of the production from casting decisions to the prevailing aesthetic of set and costume design. Putting his name above the titles was only part of Wells's bid for unqualified auteurist standing. By all accounts, Wells wanted his to be the only credit listed, relegating the names of all other contributors to a booklet that would be handed out at screenings. By its very nature, however, film is a collaborative medium. When it came to the director Korda assigned to the project, Wells was to be up against an equally forceful adversary. Things to Come was directed by William Cameron Menzies, a former production designer who was every bit as determined as Wells to impart his own distinctive sensibility to the material. Menzies's visual aesthetic is characterized by angular compositions dominated by massive sets that tend to dwarf the actors, consigning them to their impersonal margins. The spectacle of disaster seemed to come naturally to Menzies, and he no doubt took great delight in building up the gargantuan set representing Wells's anonymous British Everytown, only to demolish it through aerial bombardment and successive waves of devastation and deterioration. As a result of these and other creative tensions, Things to Come is riddled with fascinating ambiguities that deepen and enrich this already visually dazzling production. For a film that decries the senseless brutality of mankind's bellicose tendencies, it's strangely enough dominated by images of armament - from the antiaircraft guns blasting away at an unseen enemy in an opening scene that portends imminent worldwide warfare to the massive "space gun" that blasts a manned spacecraft toward its rendezvous with the moon in the film's star-struck finale. In a sense, Wells predicates the very existence of his utopia on this idea of transforming humanity's weaponry into a means of exploration - sort of a scientistic "swords into plowshares" move - abjuring a more logical means of interplanetary transportation (rocketry, for example) in favor of call-and-response imagery he seemed to find more poetically satisfying. Wells was also apparently unfazed by the crypto-fascist underpinnings to his Wings Over the World movement: What with their all-black uniforms and patent leather jackboots, they uncannily resemble an elite SS squad. It's also easy to detect none-too-subtle notes of Manifest Destiny manifest in Oswald Cabal's concluding bit of rhapsodic rhetoric. At the end of a speech extolling "conquest beyond conquest," Cabal gestures out to the glittering stars and demands: "All the universe - or nothingness. Which shall it be?" Having nearly arrived at the film's temporal terminus, perhaps it's hardly heresy to now suggest there has to be a third possibility inherent to this query, a midway point between universal annexation and existential annihilation. - Budd Wilkins, Slant, 18 June 2013. Restoration by the British Film Institute. The film has been painstakingly restored from the remaining film elements and represents the most complete version known to exist. There are dramatic improvements in every single area. Detail and especially clarity are very good. The daylight footage, in particular, often looks spectacular, especially the larger panoramic shots. The nighttime footage also conveys surprisingly good depth. Colors never collapse. There is excellent balance between the grays and blacks. Furthermore, there is a layer of fine and well resolved grain throughout the entire film. More importantly, however, there are no traces of problematic lab tinkeing. Finally, occasionally there are tiny light vertical lines or very small scratches that pop up here and there, but it is quite obvious that enough was done to remove as many of them as possible without affecting the integrity of the film. A few minor transition issues are present as well, but again, considering the fact that different elements were used to assemble this version of the film, the final result is indeed enormously satisfying. Indeed, this is one truly fabulous restoration. - adapted from Dr. Svet Atanasov, blu-ray.com, 27 July 2012.